The goal of the Del Oro Social Science Department is to prepare students to serve intelligently in a democratic society through the study of national and international historical and current events. The Social Science department invites students to explore a liberal arts curriculum which includes, but is not limited to, World History, US history, Psychology, Geography, American Cultures, and Political Science. Students emerge with a wider historical and social perspective of their country, their world, and their future. 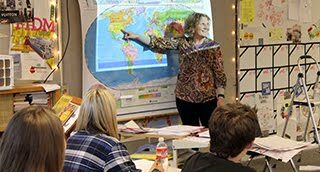 Appreciate the historical and cultural influences that shape students' individual identities, our national identity, and the cultures and countries that shape our planet. Understand successes, failures, triumphs, and tragedies in human history, particularly as they are reflected in the ideas and actions of current events. Learn to assess and interpret evidence, to understand change over time, to think logically and to communicate effectively though written and spoken discourse. environment as related to human activities, modes of living, demographics, cartography and physical, political and cultural geography. The knowledge and the reading and writing skills gained from World Geography will prepare students for subsequent Social Science courses. This course will cover United States history from its colonial period to the present. The course explores political, diplomatic, intellectual, cultural, economic and social aspects of American history. The course explores the development of the American republic, and the foundations of the Constitution, the growth of America through expansion and war, international relationships through two world wars, and the world we live in today in the aftermath of the nuclear age. In addition, the course deals extensively with reading, understanding, analyzing and interpreting a wide variety of both primary and secondary texts together with the maps, graphs and pictorial materials associated with them. Content is disseminated through a variety of methods such as class discussions, lectures, and activities. additionally, the course will address the curriculum through the application of the Common Core standards of reading analysis, critical thinking, and defending a position through argumentative/persuasive writing. This course will examine the major events that have shaped the modern world. Areas of focus will include the development of democracy including significant advancements and setbacks, the global effects of industrialization, major conflicts of the 20th century, and modern day global issues. The course will focus on the skills of reading, understanding, analyzing and interpreting a wide variety of both primary and secondary texts together with the maps, graphs and pictorial materials associated with them. The course will address the curriculum through the application of the Common Core standards of reading analysis, critical thinking, and defending a position through argumentative/persuasive writing. first European explorations of the Americas to the present. facts, principles, and phenomena associated with each of the major sub fields within psychology. They also will learn about the ethics and methods psychologists use in their science and practice. It is recommended that students take the AP Exam at the end of the term The cost of the exam is approximately $91.00. This course will examine the political and economic structure of American society. Areas of focus will include the role of government, structure of the American system of government, the components of microeconomics, the national economy, and the United States’ place in the global economy. The course will address the skills of reading, analyzing and interpreting a wide variety of both primary and secondary texts together with graphs and pictorial materials. The course will address the curriculum through the application of the Common Core standards of reading analysis, critical thinking, and defending a position through argumentative/persuasive writing. economic, social, political, and diplomatic realities in Europe. Enrolled students are encouraged to take the AP Exam. The cost of the exam is approximately $91.00. (Successful passage of the AP Exam may receive college credit.) A final exam will also be given at the end of the course. of race, ethnicity, gender, prejudices, etc. This class will provide the student with a general understanding of the human mind, behavior and the impact of Psychology on our culture. This course will give students an analytical perspective on government and politics in the United States. It involves the study of democratic ideas, balance of powers, and tension between the practical and ideal in national policy making. Students analyze and discuss the importance of various constitutional principles, and rights, procedures, institutions, and political processes that impact us as citizens. The course also requires familiarity with the various institutions, groups, beliefs, and ideas that constitute U.S. politics. *This course is taught in conjunction with Economics as a semester long course. It satisfies the Government & Economics requirement for graduation.